Puritan Sam – The new governor! It’s true! Witches are amongst us! Puritan Paul – He has turned our village into Satan’s playing ground. He has cursed the people. Their bodies distort and roar at his behest. They inexplicably shout, “Lock her up!” But who? And why doesn’t he just go ahead and lock her up? Puritan Thomas – I do believe my wife to be a witch! Sorry. Didn’t mean to change the subject, but we are on the topic of witches. Rev. Mueller – Clearly, we must thoughtfully and methodically track the governor and bring him to trial. Puritan Sam – Thoughtfully and methodically with pitch forks! Puritan Paul – And torches! Puritan Thomas – My wife can be easily found. She is in my home! Rev. Mueller – Ready your pitch forks and torches, but use them for poking for evidence and illuminating justice! We shall discuss what to look for, for I have had oracular observations of stupendous witchcraft. A witch speaks in tongues. It will sound like utter nonsense, but it is the Devil’s speech. Puritan Sam – Governor Drumpf often sends out the town crier at all hours to spout his own pronouncements that often make no sense. Puritan Paul – This would explain his orders for daily “militaribly covfefe”. Puritan Thomas – My wife often speaks in tongues. I never understand what she is saying to me. Rev. 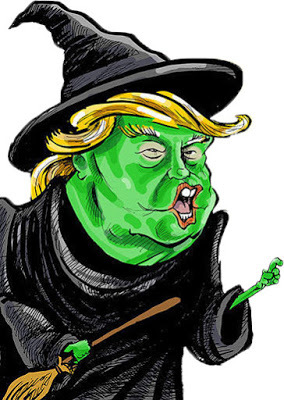 Mueller – Witches also reject the Puritan ideals of self-control and discipline. They often scorn and torment the poor and innocent instead of helping them. Puritan Sam – The governor wants to kick out all the beggars and keep all the Indians from coming in. Puritan Paul – Tis true… But I think we’re all okay with that part of witchcraft, right? I am more concerned that he has hired a lawyer to pay Goody Harlott a sack of gold to stay quiet about their liaisons. Rev. Parris – That doesn’t sound like witchcraft. Puritan Paul – I mean, he has cursed Goody Harlott! He has taken away her speech! Puritan Thomas – My wife… Help me keep her out of Salem! Rev. Mueller – The most devious sign to look for in a witch is their insistence that they are not guilty and that this is some kind of witch hunt. Puritan Sam – It is a witch hunt. We are hunting for witches. Puritan Paul – So, if they vehemently oppose our accusation of them being a witch and accuse us of just going after them because, what, we don’t like them? Rev. Mueller – They will think it is personal and not because they are, indeed, a witch. Puritan Thomas – Sounds like my wife! ALL – Lock him up! Lock him up! (PT - And her! My wife!) Lock him up! Aug 22 The Minutes of Our Last Meeting — Witch Hunt!